SeceuroGlide Manual garage doors offer the ideal solution for applications where electricity is not required or is not available. 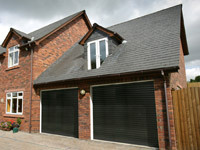 SeceuroGlide Classic roller garage doors are manufactured from tough twin-walled aluminium slats with an insulating core. SeceuroGlide Compact garage doors have been developed especially for garages with limited headroom space above the opening. SeceuroGlide Excel is the first roller garage door to offer Police Secured by Design and Insurance approval for security without compromise. At Alliance Garage Doors we concentrate only on the supply and installation of manual or electric roller garage doors, this allows us to focus on providing an efficient and cost effective service to clients looking for modern new or replacement doors. With remote control as standard, our range of automatic roller garage doors combines the convenience of power operation with smooth, vertical opening for single or double garage door openings. 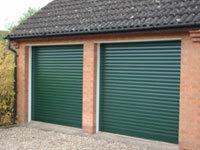 With the benefits of insulated slats these rooler garage doors provide the perfect solution for any garage. Whether you are looking for manual or electric, all our garage doors are made-to-measure to meet your opening requirements, are fully CE marked and come with a 7 year motor warranty. We use only quality garage doors manufactured here in the UK by SWS. Since launching as the first insulated roller garage doors, SeceuroGlide from SWS has maintained its position as market leader through continuous development and innovation. As well as the popular standard automatic SeceuroGlide Classic roller garage door our range also includes the stylish SeceuroGlide Compact door for where available headroom is restricted, the SeceuroGlide Manual version, the higher security SeceuroGlide Excel garage door and the modern horizontal closing SeceuroGlide Vertico. Manufactured from tough twin-walled aluminium slats with an insulating core, the curtain is held in place with high performance webbing that is unaffected by extremes of temperature. A strong extruded top slat and a patented comb locking mechanism provides security and effectively resist attack by would be intruders. SeceuroGlide is available in a choice of paint or wood-effect finishes, allowing a better aesthetic match between your roller garage door and existing paintwork or double-glazing for a more coordinated look. Our electric automatic garage doors are supplied with a single channel SeceuroSense receiver with built-in courtesy light, two key fob transmitters, a bottom slat safety sensor and an internal manual override. Style - A wide range of low maintenance colours, including textured woodgrain finishes to exactly match the latest generation of UPVC windows and doors. Space Saving - A tight coiling curtain design and discreet optional boxes maximize the drive-through height of your garage - ideal for larger vehicles such as 4x4s or people carriers. 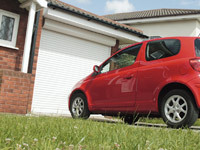 There is no intrusion into overhead storage space within the garage, and you can park safely inches from the door. Security - Automatic anti-lift locking and SeceuroSense receiver units featuring rolling-code technology ensure there is no other insulated roller garage door available more secure than a SeceuroGlide. For the very highest security specification ask us about the SeceuroGlide Excel, the only automatic roller shutter garage doors to be approved by both the Insurance Industry and Police. 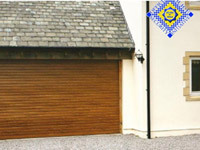 You can view a series of attack tests carried out on SeceuroGlide Excel garage doors here . A Manual locking option is also available. Safety - All SeceuroGlide roller doors are fully CE compliant and come as standard with Safety Edge collision detection and Anti-Fallback devices where required. Insulation - Insulated foam-filled slats, combined with superior guide rail inserts, bottom slat rubber seals and a curtain that finishes higher than competitor designs help increase energy efficiency and reduce heating costs, with a typical U value of 5.2 W/m2 K.
Peace of Mind - Each door is backed by a comprehensive guarantee covering all manufactured parts. In addition, the Somfy tubular motor is supplied with a full seven year manufacturer’s warranty, and textured woodgrain finishes carry a limited ten year guarantee. You can download the full product brochure here. As well as the standard white finish our garage doors can be supplied with a coloured or textured finish depending on the type of door to help ensure they become a real asset to your home. We are members of the Construction Industry Training Board (CITB) and accredited by the Contractors Health & Safety Assessment Scheme (CHAS) and achieved accreditation from Alcumus Safe contractor for our commitment to achieving excellence in health and safety. Staff hold current CSCS Health & Safety and Roller Shutter Installation Cards for the construction industry. We are also members of the Federation of Small Businesses (FSB). We are members of the Oldham Council ‘Buy with Confidence’ scheme which is managed by their Trading Standards Department. As local garage door installers we are able to provide a quick and efficient service across the region including Manchester, Bury, Stockport, Oldham, Rochdale and Saddleworth. Manual garage doors and automatic roller garage door installers supplied and installed throughout Manchester, Rochdale, Oldham, Bury, Saddleworth, Stockport, Chaddertonand Bramhall. First for SWS Seceuroglide roller shutter garage doors in and around Manchester.